The best way to get the most bang for your research and development buck is to design a standardized platform. A platform refers to a structure, design, or layout that forms the base for a variety of “different” products, allowing for simplified engineering and manufacturing. The most common example of this is the automotive platform. In the automotive industry, cars are very often designed to fit onto a platform, a standard base frame/body/engine configuration that reduces costs associated with development and manufacturing and creates many interchangeable parts that end up fitting on very different vehicles. As a result, you can get wildly different vehicles built from the same base. Both the 2007 Mitsubishi Lancer and the 2007 Jeep Patriot are based on the Mistubishi GS platform. How about the 1979 and 1994 Ford Mustangs? Yup, same Fox body platform (not to mention the 1984 Lincoln Continental). This happens every year in the auto industry and has become a mainstay for developing models for every company. Even some very high-end companies use it, like Lotus and Tesla, of which the Elise, Exige, and Tesla Roadster are all based on the same Lotus-engineered platform. The entire concept of a platform would have been impractical before modern manufacturing techniques made repeatable parts a reality. And for those thinking ahead, it is also pretty much what the entire watch industry is based on, since movements drive design and very few brands build an entirely new movement for each new model (the only one coming to mind right now is A. Lange & Söhne). But in the watch industry, the highest end pieces do tend to be slightly more exempt from this trend simply because they end up being extremely complicated and often unique in construction based on some novel idea or design. Yet while used across multiple models, the platform is very visible at the higher end of haute horlogerie, because throwing away hard-earned research and development would be a true waste. So interesting ideas and movements find new lives in a variety of ways in watches. One of the more regular avenues is highly artistic watches; pieces that feature a creative movement and artistic expression used around a novel display or complication to create new models and collections. Vacheron Constantin does this fantastically well with the incredible Caliber 2460 G4 that forms the basis of various Métiers d’Art collection pieces (for more on those pieces, see Wild Things! Vacheron Constantin Introduces One-Of-A-Kind Les Cabinotiers Mécaniques Sauvages Watches). Vacheron Constantin’s Caliber 2460 G4: a platform that flies! Caliber 2460 G4 was introduced in 2005 in honor of Vacheron Constantin’s 250-year celebration (see How Vacheron Constantin Celebrated Its 250th Anniversary In 2005). It introduced a technology the brand calls “dragging” and jumping disks, which indicate the hours, minutes, day, and date in small windows in the corners of the dial. This movement has since found its way into various models. At SIHH 2018, Caliber 2460 G4 powered a new set of timepieces called Les Aérostiers, which commemorates the first humans to fly at the end of the eighteenth century thanks to the newly invented hot air balloon. The name, which translates as “the balloonists,” seeks to highlight important flights in the early days of aviation as the young technology was being explored. There are five versions of Les Aérostiers, each one named after the location and year of an important flight to tell its own fabulous story. Like Versailles 1783, which commemorates the test flight of an aerostat designed by Étienne de Montgolfier with some furry friends on board. The other four include Paris 1783 for the first manned Montgolfier balloon; Paris 1784 for the first winged balloon; Bordeaux 1784 for a balloon carrying three passengers; and Bagnols 1785 to commemorate a flight witnessed by 10,000 people. The five versions differ mostly in the highly detailed bas-relief engravings of the balloons, which in the 1700s were all individually handmade and decorated to extraordinary levels (though if they had understood anything about the principles of buoyancy they would have made them much simpler). Each of the balloons in the Les Aérostiers line has a unique look and shape, with one even featuring wings. The engravings are incredible, and when combined with the variations in white and rose gold creates a marvelous sculpture for the wrist. Each dial also has a different plique-à-jour enamel background (representing the skies) of varying color and effect. Playing with transparency and opaqueness, the enameled expanses allow a glimpse of Caliber 2460 G4/1 underneath, or at least its disks for the four displays. The enamel is perfectly crafted, and since plique-à-jour is such a finicky enamel technique the effect is doubly impressive. The dial features four windows for the displays, which follow the swooping pattern of the enamel sections. In the top corners of the dial you have the slowly rotating hours and minutes (no jumping disks here), while in the bottom corners the date and day of the week jump like normal date disks. These “platform” displays really complement the structure of the watches with the large bas-relief engraving taking the spotlight on the dial. 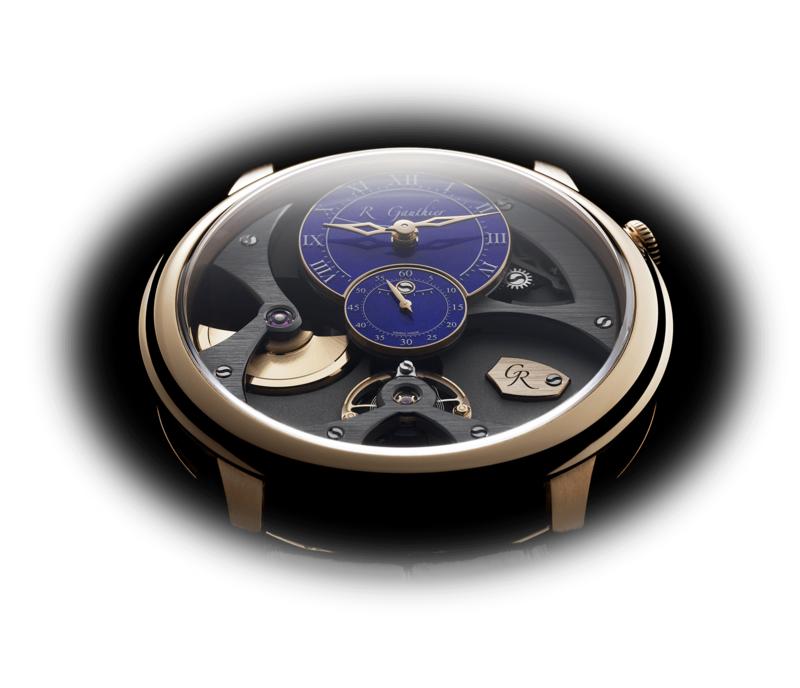 The Métiers d’Art line uses the platform concept like many brands do for their various lines (even though watch companies don’t call it that), and it does exemplify how a nice solution for a unique display can be used in a variety of visual ways. Caliber 2460 G4 is found in at least three different lines of art pieces including a new line of unique pieces dubbed Mécaniques Sauvages, where various calibers are used but the 2460 G4 is found in a few examples. Along with the Legend of the Chinese Zodiac (see the latest in Happy Chinese New Year With 8 Dog-Themed Lucky Watches) and Les Aérostiers, the lines show that a movement designed to display its information at the very edges of the dial has so much potential for design. Centered time displays are the norm around the industry, and yet there have been millions of varieties on that layout. Within Vacheron Constantin’s Métiers d’Art collection there are also some fabulous examples using that layout as well as using the same calibers in dramatically different ways. The 2460 G4 is entirely different and very visually interesting (not to mention mechanically interesting), and so just like center time displays the possibilities are nearly endless. Thanks to the ability to update style using the platform of a standardized movement, Vacheron Constantin has the ability to highlight artists without sacrificing readability or the display of the artisan’s craft. Watch dial real estate is about as competitive as downtown San Francisco (okay, nothing is quite that competitive; it’s crazy out there) so being able to utilize so much of it for design, and knowing that the design won’t be compromised by hands passing over details throughout the day, is huge. One of my biggest pet peeves with artistic watches, or even certain dial layouts for regular watches, is the requirement that parts of the dial be obscured at specific times of the day because the hour or minute hands are inevitably right above them. I have a jumping hour watch whose hour numeral is displayed just below 12 o’clock, meaning the numeral is ALWAYS underneath the minute hand when the jump occurs. Shoddy design, man, shoddy design. So having set areas that are rather small compared to the entire dial where the time, date, and day are displayed (from underneath, mind you) allows so much more of the dial to highlight an amazing engraving, a terrific miniature painting, or some tremendous enamel. That is why I love Caliber 2460 G4, which was designed to make artistic watches better and allow for serious variation down the road. When you think of the possibilities not just in highlighting artistic craft, but in the dramatic expanse that could be utilized for literally anything, this movement becomes a bit of a unicorn. Les Aérostiers is an amazing concept; the dials are intensely beautiful with displays that are subtle and under the radar. They do their job without detracting from the art splashed across the dial. This really shows how useful Caliber 2460 G4 is for promoting the dial design. The Métiers d’Art collection from Vacheron Constantin uses the caliber beautifully for a variety of ideas. It is a perfect marriage of design and engineering and a platform that supports the continued creation of artistry at the brand. Thanks to Caliber 2460 G4, Les Aérostiers is a beacon of hope for the continuation of the Métiers d’Art line. I can’t wait to see what Vacheron Constantin has in store for it next – perhaps a non- Métiers d’Art piece? Something modern that utilizes the layout in entirely new, avant-garde ways? Probably not, but a guy can hope! So let’s make it explicit and break it down! Wowza Factor * 9.77 The craft and beauty is hard to ignore in all its forms! Late Night Lust Appeal * 88.3» 865.927m/s2 Balloons can lift you to great heights of imagination, and these watches are no different! M.G.R. * 62.5 Any unique display based on disks will always be worth of geeking out over! Added-Functionitis * Mild It does have a day and date, so it doesn’t leave us empty handed. Still, nothing to go gaga over, so I would recommend children’s strength Gotta-HAVE-That cream for these fanciful creations! Ouch Outline * 10.3 Super gluing your fingertip to something and peeling your skin off just to free your finger! Ouch, that’s all I gotta say. Still, I would do it again if it meant getting this watch on my wrist! Mermaid Moment * Immediate! It doesn’t take much to see why this piece deserves a six-tier cake and a beautiful reception! Awesome Total * 763 Multiply the number of watches in the limited editions (5×5=25) with the diameter of the case (40) and subtract the number of components in the movement (237) for a floatingly awesome total! For more information, please visit www.vacheron-constantin.com/en/watches/metiers-d-art. My comment on this post is based on its significant contribution to the emerging documentation on the luxury wrist watch as Metiers d’Arts. It provides a succinct window into understanding how a standardized mechanical platform (that can be beautiful in itself) provides a miniaturist canvas for dial design that is exquisite in it’s execution of imagery and in this case it’s storytelling of hot air ballooning. Recently, I saw the movie (DVD version) of the movie, “The Hindenburg” which has a great introduction to hot air ballooning. This fits perfectly into Vacheron Constantin’s model line of Les Aerostiers. Follow this commentator to advance your own understanding of luxury watch technical elements coupled with creative design. You won’t be disappointed.